The Hampton Inn Nashville/Bellevue-I-40 West hotel is located in Bellevue off Interstate 40 at the 196 Exit on Hwy 70S just ten miles southwest of downtown Nashville Tennessee. Area attractions near our Tennessee hotel include the Bellevue Mall Percy Warner Park Natchez Trace Parkway Cheekwood Botanical Gardens Vanderbilt University the Parthenon museums downtown Nashville and the Grand Ole Opry and Museum. Hotel guests of our Nashville Hampton Inn can dine at a variety of nearby Bellevue restaurants including Antonio*s Fine Italian Chaffin*s Barn and Dinner Theater Sam*s Sports Bar - Grill Cancun Mexican Restaurant Sperry*s Steakhouse Waffle House Applebee*s and Golden China. 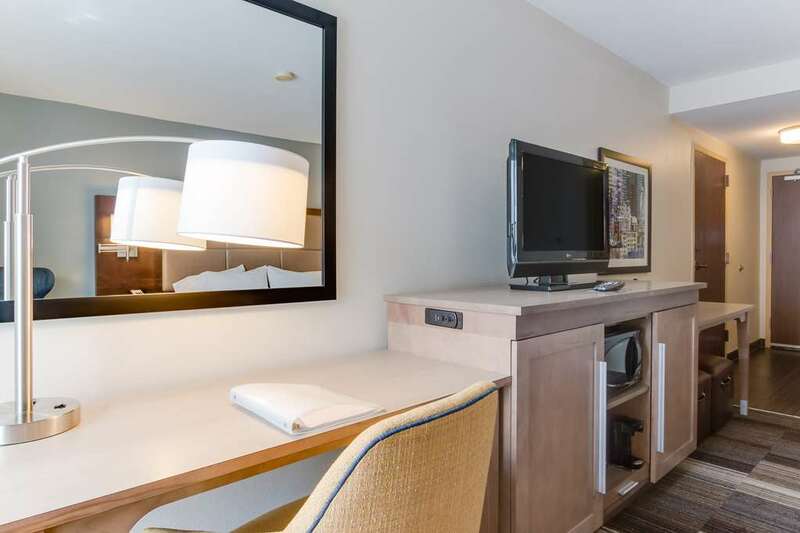 Our Bellevue area hotel features 86 amenity filled rooms which include coffeemaker hair dryer phones with voicemail and data ports and cable TV with HBO and pay-per view movies. Guests can request a King Study room connecting rooms cribs and laundry and valet services. Sure to please the busy executive or leisure Tennessee traveler guests of our Hampton Inn Nashville hotel will enjoy complimentary On the House hot breakfast buffet served daily and complimentary high-speed internet access throughout the hotel. After a busy day Nashville visitors can relax in the outdoor pool or work out in the fitness center. Meeting and banquet facilities with audio/visual equipment are available for a nominal fee. We love having you here in Tennessee at the Hampton Inn Nashville/Bellevue hotel.